Bristol is doing some great work for cyclists, doubling bike use between 2001 and 2011, the biggest growth in modal share outside London. In 2008 it was named Britain’s first official ‘cycling city’ and though the scrapping of Cycling England in 2010 threw a metaphorical umbrella in the spokes, things are looking up again, thanks to a new cycling-friendly mayor, local campaigning and a raft of new funding. It’s a beautiful sunny morning in Bristol city centre when we go to take a look. Meeting outside the Sustrans HQ, by Bristol’s College Green, the sustainable transport charity’s local area managers Jon Usher and Rupert Crosbee have both kindly agreed to show CW how and where cycling has been developing in the city. Usher explains some recent history first. The so-called ‘bonfire of the quangos’ in 2010 came just as cycling in Bristol was really making progress. “With the abolition of Cycling England, there was no ongoing cycling city funding, which resulted in the immediate dispersal of the cycling delivery team, me included, onto other things,” he says. This walking and cycling dispersal was mirrored in Bristol City Council. Just before we set off, John Richfield, Bristol’s senior engineer for cycling policy, joins us on our tour. Holding one of the council’s two remaining cycling-specific posts (of a former five), with 12 years’ service in the council, he’s seen all the highs and lows. We head for Queen Square, one of the success stories, where shared gravel paths now converge around a statue of William III. In the 18th century this was the Bristol address, before being upstaged by nearby Clifton and then, in the 20th century, bisected diagonally by the A4. Now it’s dotted with people heading to work on foot and increasingly, on bike. Richfield explains: “This square was once a horrendous urban motorway. There was resistance over the redevelopment from local firms, who said it would kill them, but since it’s been put in, people have been very pleased and rents in the city have actually gone up. 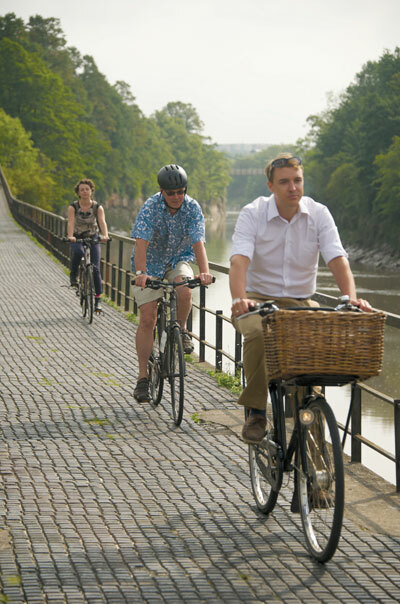 Many of Bristol’s pavements and paths are shared with cyclists. Routes like Brunel Mile are so successful, however, with thousands of users each day, that some of this shared space now needs segregating. On-road segregated routes would seem a good option. We stop on the dual carriageway beside the city’s main station, Bristol Temple Meads. This is the UK’s only urban enterprise zone, with the station at its heart. The regenerated Temple Quarter could create 17,000 new jobs. 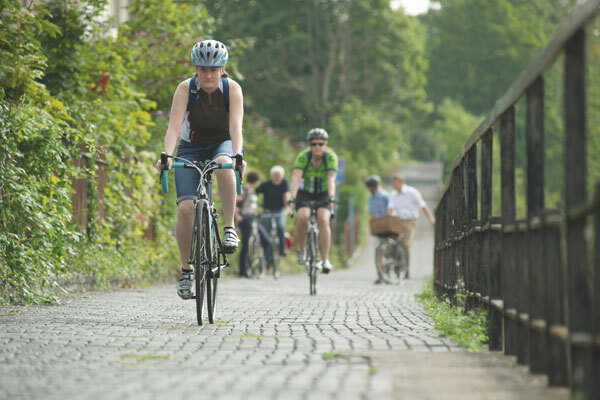 With £20.85m government funding to keep those people moving – plus the nine million that come through the station every year – cycling is a cost and space-effective transport solution, and a network of cycle lanes is being planned. 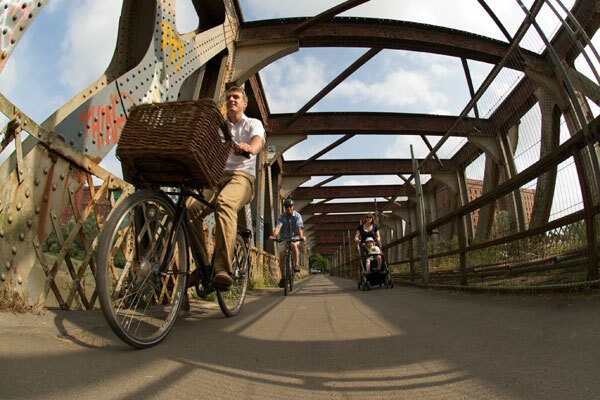 Bristol has also been allocated LSTF funding, which replaced Cycling England funding, plus a share of £7.8m under the Cycle City Ambition Fund (CCAF) announced in August, which will all help facilitate the mayor’s aim to double cycling by 2020. Richfield has spent 12 years arguing cycling’s corner. “I think we’re starting to get the network effect, one that’s comprehensive enough for people to use without much trouble,” he says. There’s a long way to go, however. The River Avon still presents a natural barrier for cyclists. Along Clarence Road, running alongside the Avon, there are plans under the CCAF for a Dutch-style segregated cycle path, with the so-called banana footbridge halfway along getting a new cycle ramp. However, Clarence Road is bookended by large motorway-style roundabout bridges, which will be more difficult to tackle. In contrast, the Chocolate Path is a peaceful waterside foot and cycle path between a disused railway track and the Avon, which is due to be widened and upgraded with cycle access onto the existing pedestrian bridge. However, it takes its name from the pattern of the paving, which can prove treacherous in icy weather and can cause a tramline effect for skinny tyres. Unfortunately, because it’s listed, it can’t be altered. A similar problem exists where cycle access to a pedestrian bridge needs to somehow cross the disused railway line without altering its appearance. After the Chocolate Path we ride under the A3029, “Britain’s first covered cycle path,” as Richfield puts it. This is part of the Festival Way, comprising pieces of existing and upgraded infrastructure with new routes joining the dots. 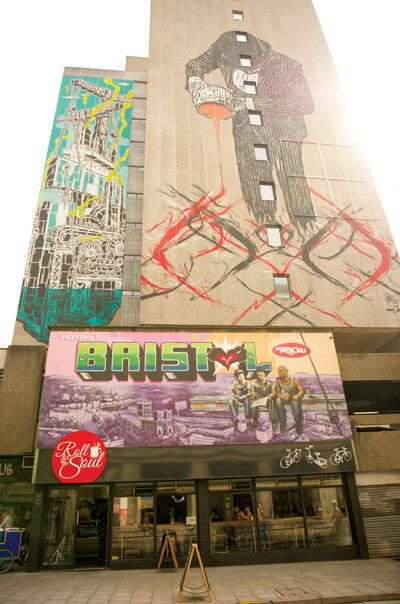 As we leave our guides at cycling cafe Roll for the Soul, Richfield is positive about Bristol’s cycling future: “There’s a lot happening and from the mayor down there’s an acceptance and understanding of what has to happen, though not necessarily how. The mayor is able to provide the impetus and give everybody permission to think radically. 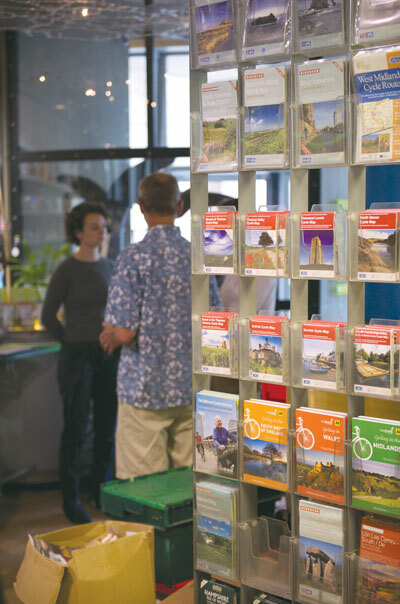 Helping people commute by bike, the Festival Way is a nine-mile route from Bristol city centre to Nailsea, via Ashton Court, home to Bristol’s balloon fiesta. 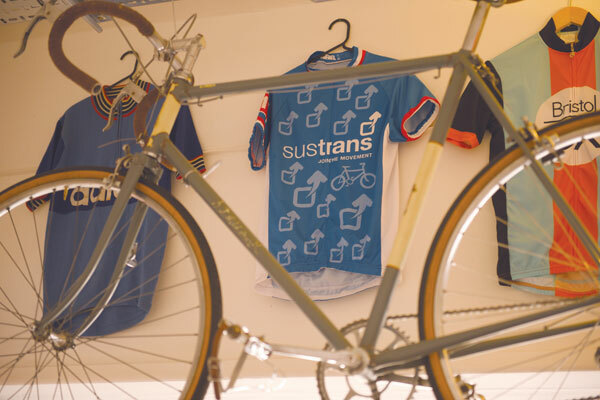 Where commuters from south of Bristol contend with a tangle of fast A-roads, the popular Festival Way now provides a largely off-road alternative for those who want to cycle, as well as letting mountain bikers ride to the local off-road tracks. At Kennel Lodge Road, which leads to Ashton Court, however, planning permission was turned down by North Somerset Council for 50 metres of the planned route. Sustrans’s Jon Usher was unhappy with that decision. He says: “That was very disappointing. Now you have to go up a really steep hill, though most people opt for a shared path along a dual carriageway to avoid it! Pero’s bridge near Queen Square is one of the UK’s standard three-metre wide shared paths and with pedestrians and buggies using it with cyclists, it’s crowded even on a weekday. Neither of them have enough space and Jon Usher and Rupert Crosbee argue that new paths, especially bridges, which can’t be widened later when cycling increases, need to be at least four metres wide. On Clarence Road, alongside the River Avon, a row of empty parking spaces is going to make way for Bristol’s first Dutch-style cycle lane, complete with ‘floating bus stops’ (where bike paths go behind bus stops, so cyclists don’t have to overtake buses), paid for by Cycle City Ambition Fund money. This article was first published in the October 10 issue of Cycling Weekly. Read Cycling Weekly magazine on the day of release where ever you are in the world International digital edition, UK digital edition. And if you like us, rate us!